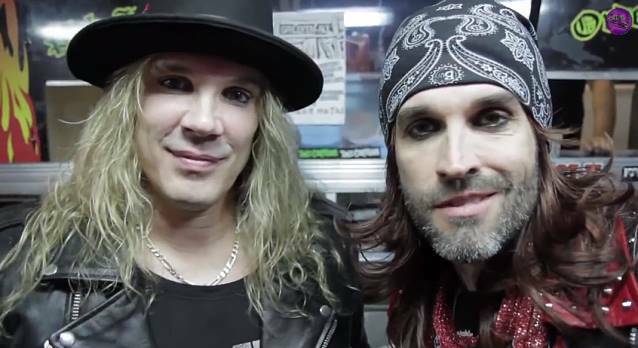 Los Angeles glam metal jokesters STEEL PANTHER partnered up with acclaimed Los Angeles food truck Grill 'Em All for a promotion to coincide with the announcement of the release date of the band's third full-length album, "All You Can Eat". Grill 'Em All was the winner of the first season of the "Great American Food Truck" on the Food Network and is known for their heavy metal themed burgers. 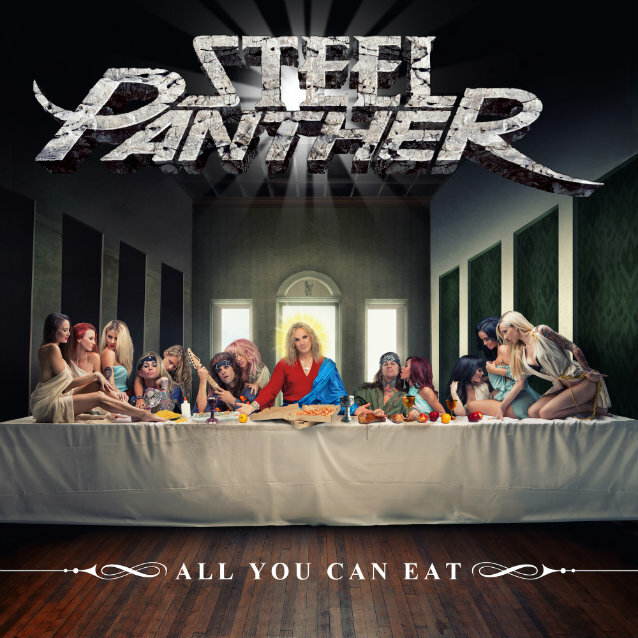 The band unveiled the album cover of "All You Can Eat" on the Grill 'Em All truck and the truck roamed around Los Angeles giving away "The Fat Girl" and the "Eatin' Ain't Cheatin' Cheeseburger" for free to all STEEL PANTHER fans in Los Angeles. "All You Can Eat" will be released in the United States on April 1 on Open E Records via Kobalt Label Services (KLS). The 12-song CD, which was produced by Jay Ruston (ANTHRAX, ADRENALINE MOB), is available for pre-order at SteelPantherRocks.com. From the opening acoustic riff of album opener "Pussywhipped" to final chord hit in the album closer "She's On The Rag", it is clear STEEL PANTHER is back and better than ever. Songs like "Gloryhole", "Gangbang At The Old Folks Home" and "BVS" all showcase STEEL PANTHER's incredible musicianship and ability to write memorable and sometimes educational songs. The debut single, "Party Like Tomorrow Is The End Of The World", was released in November with a star-studded video directed by Rob Riggle that has been viewed over 680,000 times. Speaking to the South Bend Tribune, STEEL PANTHER drummer Stix Zadinia (real name: Darren Leader) stated about the band's new CD: "If you liked [2009's] 'Feel The Steel' and [2011's] 'Balls Out', you will love this record. 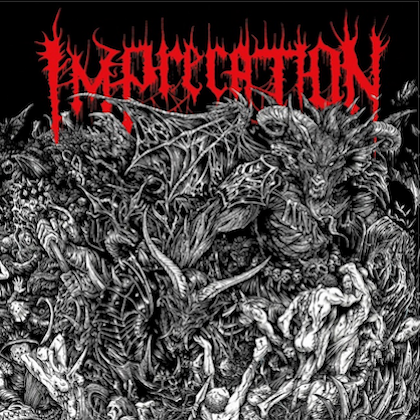 It is more heavy metal songs that are hooky and great and fun and make you want to rock and make you want to have a good time and party. 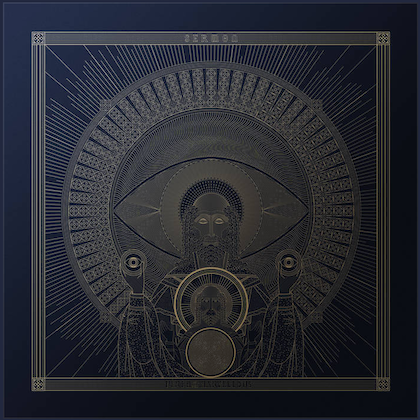 Also, there is a lot of riffage on this album that I think anybody who has ever questioned this band — 'Oh, those guys wear spandex and it is 2000-whatever' — these songs are going to put all of that to rest." "Balls Out" sold nearly 12,000 copies in the United States in its first week of release to debut at position No. 40 on The Billboard 200 chart.